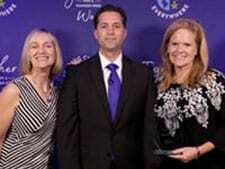 Lisa and Jane accept the Event Planners Award at the 2017 Hunger Hero Awards hosted by Feeding Children Everywhere. We were wildly excited to win the Event Planners Award at the 2017 Hunger Hero Awards hosted by Feeding Children Everywhere. We are proud to partner with Feeding Children Everywhere, to implement a Soup’s On food packing activity that finds guests assembling healthy meals that are all-natural, non-GMO, gluten-free and vegan for those in need. 30,000 healthy meals were packed at this Soups On event. Kids love bikes, but these are much more than just a toy to many of these kids. For many, it’s their main means of transportation and the bikes are used to get to and from school, as well as after school jobs. 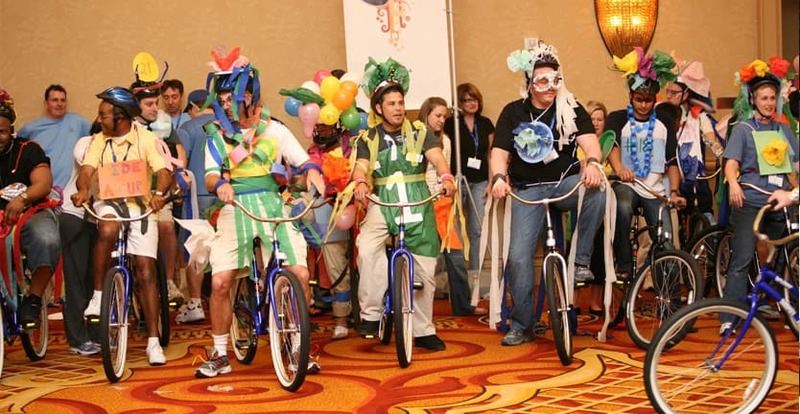 And sometimes, those jobs lead to careers – one of the directors of a Boys & Girls Club that accepted the bikes after one of our CSR activities told us he once got a bike in an event just like it when he was young. As a result, he decided he wanted to dedicate his life to the organization as it made such an impact on his life. Blanket assembly and bear stuffing CSR activities result in goods that are a great comfort to a child in the hospital. But, sometimes it comforts the parents too, as sadly that bear or blankie may be the last item that child held before they passed away. It’s not always the sick child who gets the goodies from these CSR activities – sometimes it’s equally as important that their sibling – who doesn’t understand why their brother or sister is “getting all of the attention” – receives a gift too, so they don’t feel ignored. Corporate Employees Participating in the Toy Chest Challenge Get to Have Fun Too! Kids love to play video games. But, for one organization the Xbox they received wasn’t a way for the kids to escape the real world. It was a way for all of the kids to use the immersive dance game that came with it as a way to interact and spend quality time together. In one of these CSR activities the kids got to ask for a specific gift after the event. Instead of thinking of his own needs, one kid simply asked for a coffee mug to give to his Mom. 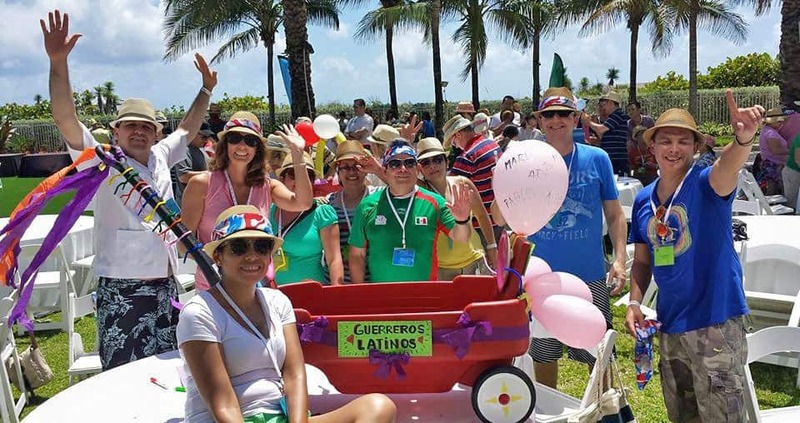 Like Build A Bike, the Red Wagon Brigade is a fun team building activity that is always a big hit. It’s not always kids who appreciate the red wagons assembled and decorated in this, one of our favorite CSR activities. One organization we worked with gave them to the elderly, so they could get their groceries from the store to their home. Sure, kids love playing with a Radio Flyer Wagon. But, did you know that hospitals use donated red wagons as a less scary way to transport frightened kids from their room to get treatments? And, the toys that fill the wagons at the end of these CSR activities are also used to distract these kids as they get their treatments? 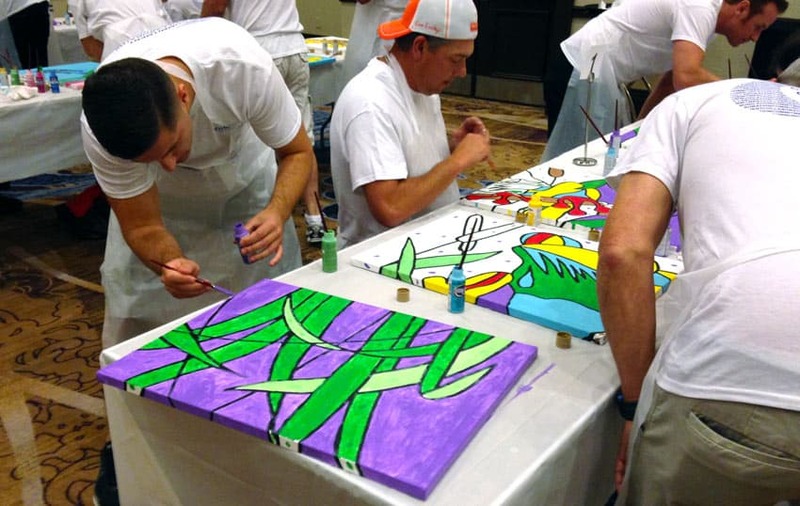 Teams get to show their artistic side during this fun team bonding challenge. 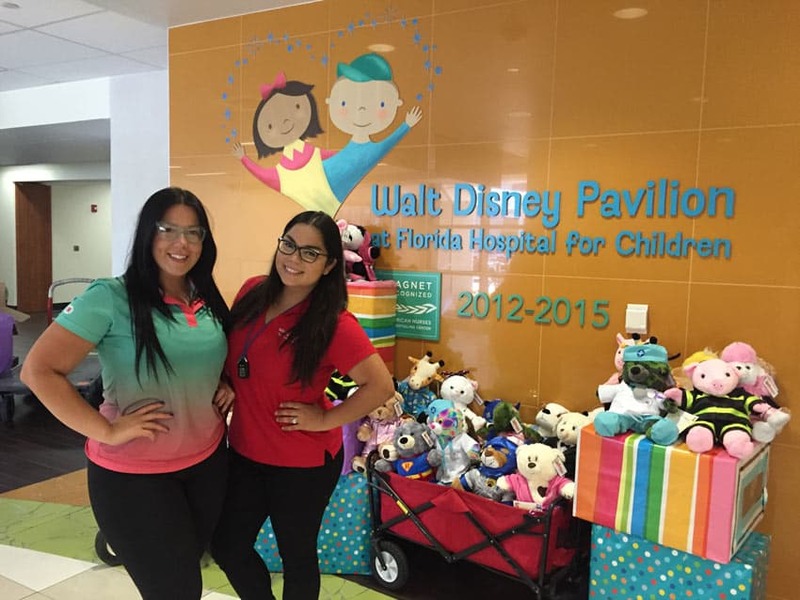 Another of many CSR activities we implement that help to distract sick kids in the hospital. Teams paint a mural to hang in a hospital because after all, which offers more comfort? A bright, friendly mural, or a stark, sterile white wall? We have many CSR activities that help organizations that emphasize education as a way for kids to have a better life. This one focuses on kids who are successful enough to get a college scholarship, but as kids “foster out” of the system at age 18, they literally have nothing. Teams compete in games to fill a laundry basket with necessities for these kids’ dorm rooms. In this CSR activity, teams build furniture and collect items to fill apartments being made ready for women leaving an abuse shelter. One woman, upon receiving a new set of drinking glasses as a result of one of these CSR activities, burst into tears because she had never owned a proper glass to drink out of. Think kids hate getting clothing? Think again! When children are put into foster care, nobody warns them it’s about to happen, so often the only thing they leave home with are the clothes on their back. Teams have fun making sculptures out of clothing in these CSR activities, but the smile this clothing puts on the face of the children receiving brand-new clothing, instead of the second-hand clothing donated to them, is one of the best reasons for doing CSR activities like this one. Everyone donates toys at the holidays. But, one of the biggest items on kid’s lists? Shoes! Many have never owned a new pair in their lives and those with ugly shoes are an easy mark for bullies at school. 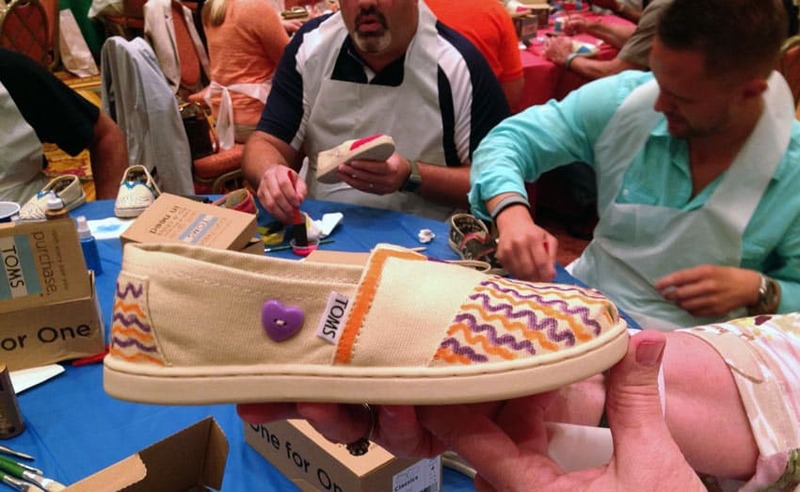 That’s why we created CSR activities like this that result in TOMS shoes being decorated and donated. One organization used the new shoes from one of these CSR activities as an incentive – if the kids could pull up their GPA, they could pull on a brand-new pair of shoes! 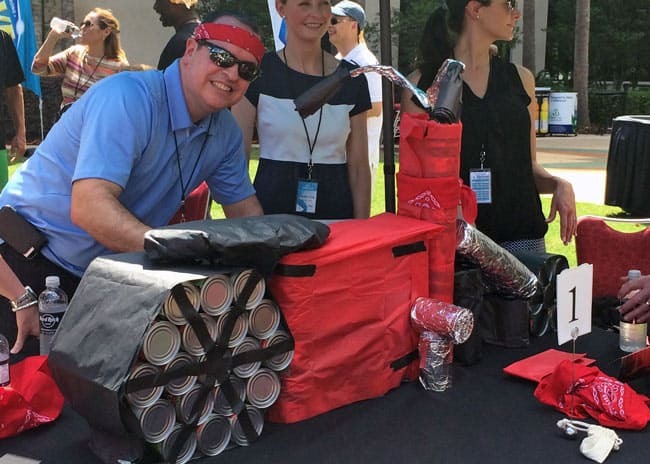 Your teams show their creativity building structures with cans that are then donated to charity. You know the saying that you get more with the carrot than with the stick? Well, replace “carrot” with Oreo cookie and you’ll understand how the cookies donated from one of these CSR activities improved the behavior of the kids at a Boys & Girls Club, who were promised a treat in exchange for good behavior! People assume there’s plenty of food donated at the holidays. Not so! One organization we worked with was in a panic about meeting the demand for Thanksgiving dinners until they received the donation from one of these CSR activities and were able to feed the surplus of people needing food on their table on turkey day.